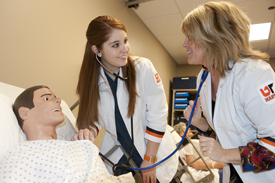 Becoming a nurse is challenge enough for most any college student, but Teresa Fowler doesn’t mind pushing her limits. The junior from Camden, Tenn., has added “University of Tennessee student trustee” to her growing resume as she serves a two-year term on the UT Board of Trustees while completing her UT Martin nursing degree. Teresa grew up an only child on a 200-acre farm in Benton County that’s been in her family for more than 150 years. She balanced work responsibilities on the farm with outside activities, finding time for cheerleading and serving as Camden Central High School’s delegate to Volunteer Girls State. Her college experience took an unexpected turn last spring when Steve Vantrease, Student Government Association adviser, encouraged Teresa to run for student trustee, a position elected by students and chosen by Tennessee’s governor. “I didn’t think I would get elected, but I did, so that really encouraged my interest in the position,” she said of the post that rotates to a UT Martin student every four years. The top three names from the spring election were sent to Gov. Bill Haslam, who chose her for the opening. A non-voting member her first year, Teresa becomes a voting member in 2012-13. Although new to the UT board, Teresa is already juggling a busy and varied schedule. “It’s mostly time management,” she said. “I have to set aside time for nursing and set aside time for the board. It’s difficult because I can’t miss (an) extreme number of classes for board meetings.” She credits the nursing department for working with her schedule so that she can attend full board meetings in October and February. Teresa plans further study to earn a nurse practitioner’s degree and fulfill her dream to make a mark in the medical profession. She might even pursue another dream to run for public office. So whether she’s helping people to get well, or representing them as an elected official, expect Teresa Fowler to use her UT Martin experience to make a positive difference for others. Teresa was appointed for a two-year term to the UT Board of Trustees by Tennessee Gov. 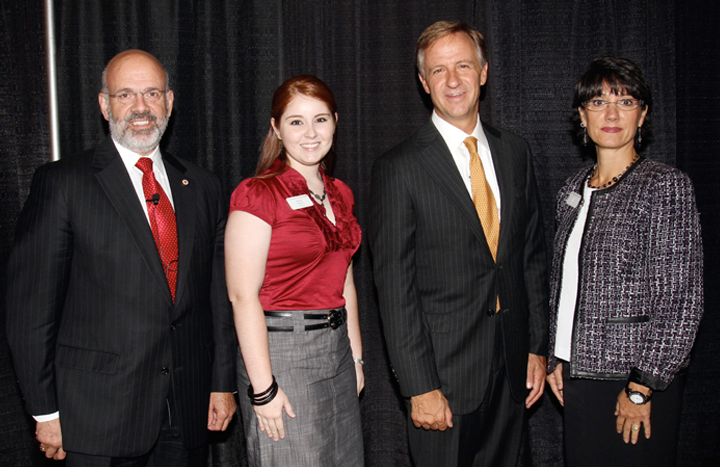 Bill Haslam (second from right). She was introduced to the board at the June meeting in Knoxville. Also pictured (far right) is Dr. Janet Wilbert, faculty trustee from UT Martin, and Dr. Joe DiPietro, UT president.